Image taken from National Geographic website. So I stumbled upon this interesting bit of research that was covered by TIME MAGAZINE, concerning the genetic engineering of a tobacco plant with firefly dna. 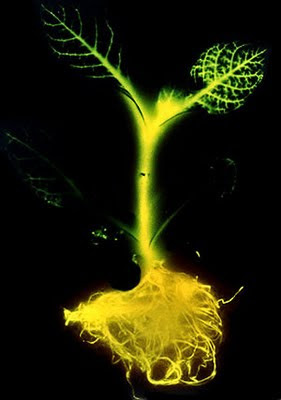 The result being a plant that totally glows in the dark on its own. It sounds like a child's riddle: What do you get when you cross a firefly with a tobacco plant? Answer: tobacco that lights itself. That is essentially what a team of scientists at the University of California at San Diego has done. By outfitting a fragment of a plant virus with the gene that tells firefly cells to produce a protein central to generating light, the researchers have created a plant that literally glows in the dark. Additionally, here is a National Geographic article that shows some more crazy glow in the dark animals and plants. The REAL reason for the Ammo demand shock! Pistol Gunblade - For Real!